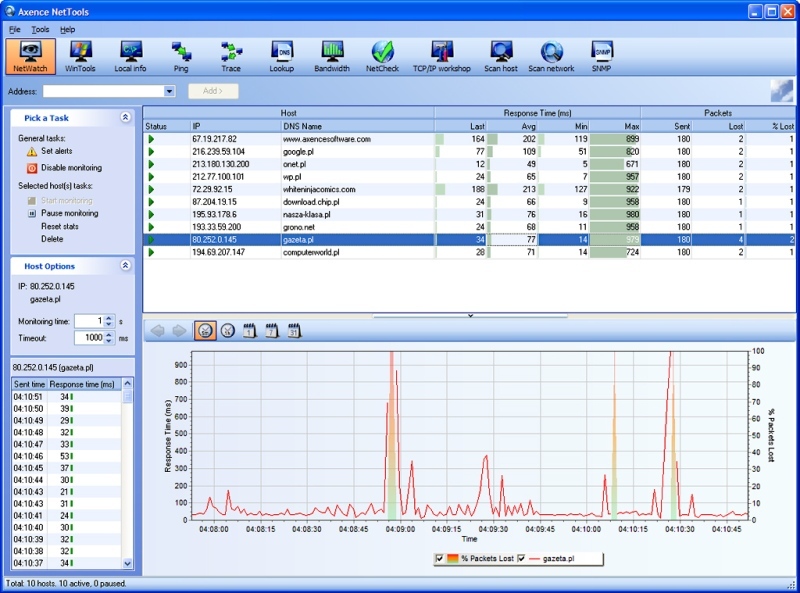 Axence NetTools Pro is a FREE and very comprehensive set of network administration tools: NetWatch - network monitoring with alerting, real-time & historical charts; WinTools lists exhaustive system information from Windows computers; port scanner; network scanner; NetStat lists local inbound & outbound connections; TCP/IP workshop for low level service testing; ping; fast traceroute; DNS lookup; bandwidth test tool; SNMP browser and more. ...... It can discover some Trojans/spyware. Qweas is providing links to Axence NetTools Pro 4.0 as a courtesy, and makes no representations regarding Axence NetTools Pro or any other applications or any information related thereto. Any questions, complaints or claims regarding this application Axence NetTools Pro 4.0 must be directed to the appropriate software vendor. You may click the publisher link of Axence NetTools Pro on the top of this page to get more details about the vendor.